Whether you’re a visitor or an exhibitor, if you’re in the middle of planning your strategy for the UK’s premier rail exhibition, you’re in good company. If 2017 is anything to go by, almost 10,000 people will make the biennial trip to the NEC, Birmingham, between May 14-16 this year for Railtex. Such is the show’s draw that hundreds of these will have travelled from overseas to be a part of the hive of activity, with dozens of non-UK companies also exhibiting their products and services. Despite living in an increasingly digital world, the show offers the invaluable opportunity to network, make new connections, spark new ideas and build on existing working relationships. Put in context of Network Rail’s plans to spend more than £48 billion for CP6 and you start to understand why there is an excitement surrounding this year’s show. Wind the clock back two years and Stephen Brooks, chairman of organisers Mack Brooks Exhibitions, opened Railtex by revealing that it featured more exhibitors than at any other point in the last decade. Numbers have steadily risen from 424 to 470 since 2011, so it’ll be interesting to see how many 2019 attracts. Less than a month before the 2017 show, a general election was called so, with purdah in full swing, politicians stayed away and speakers such as Francis Paonessa, Network Rail’s managing director for Infrastructure Projects, were limited in their presentations. Nevertheless there was much to discuss in the exhibition space. Innovator 42 Technology had a working prototype of its adaptable train carriage system on display. This system condenses unused seating capacity to free up room for cargo. 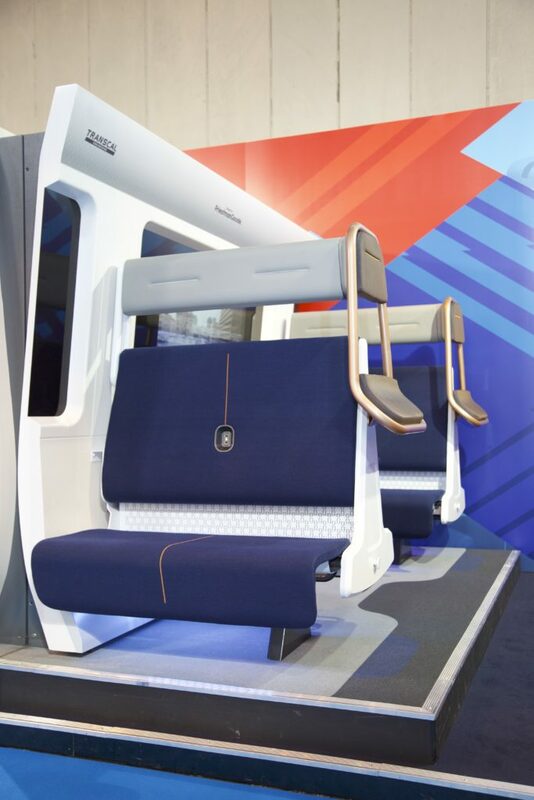 On a similar theme, Priestman Goode’s stand showed its flexible seating solution which provides a regular seating configuration for off-peak that can be transformed into a higher density configuration at peak times to increase seating and standing capacity by up to 20 per cent. Rolling stock products were exhibited by many of the major players, including Talgo, CRRC and Hitachi, which both showed concept trains for HS2. Alstom also launched a new EMU for the UK – as well as its new CLever cantilever – blissfully unaware that transport secretary Chris Grayling would scrap electrification plans in the Midlands, Wales and north of England in favour of bimode trains months later. 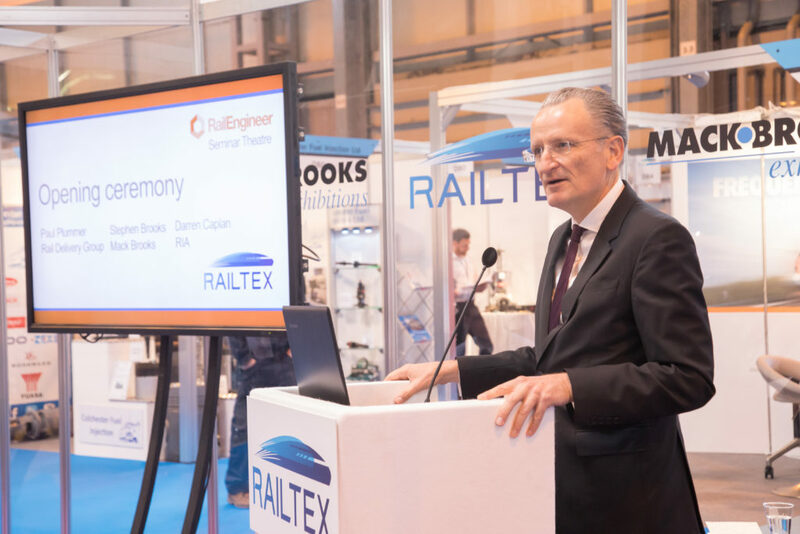 Looking ahead, with 20,000m2 of hall space bursting full of exhibitors, technical presentations and keynote speeches across three days, RailStaff has picked out some of the presentations and stands which could prove to be highlights for Railtex 2019. For those wanting to add to their rail industry knowledge, a visit to the show’s three presentation areas is a must. Rail Engineer will once more host a selection of technical presentations at the CPD-certified Seminar Theatre (D61), including Baroness Fairhead, Minister of State at the Department for International Trade, who will kickstart the programme on the show’s opening day. Gordon Wakeford, the head of Siemens Mobility in the UK, will speak on the Wednesday at 10:30. He is also co-chair of the Rail Supply Group and as such he was instrumental in developing the Rail Sector Deal, which he will discuss as one of three keynotes in the Seminar Theatre. Joining them as a keynote speaker is Stuart Calvert, interim managing director of the Digital Railway. Stuart recently replaced David Waboso and will talk about Network Rail’s reorganisation and how further devolution will impact the Digital Railway programme. Elsewhere, in the Railway Industry Association’s (RIA) Knowledge Hub (P81), a selection of project updates, industry briefings and forum discussions with influential industry leaders will take place. RIA’s electrification report, which sets out how costs could be lowered by as much as 50 per cent (Thursday, 10:30). The speaker programme for the third conference area, the Future Focus Conference, is yet to be confirmed. It will focus on high-speed rail, sustainability and digital rail and will be headlined by a keynote speech from rail minister Andrew Jones. This conference will take place on the Wednesday. Before we went to press, Mack Brooks Exhibitions confirmed that 420 exhibitors had now booked stands for Railtex with only a few spaces remaining. Full details on all of them are available on the Railtex website. On the following pages we have highlighted a few of the household names and what they’re planning to promote. A feature of Alstom’s exhibition will be a new hydrogen train for the UK market. Codenamed ‘Breeze’, this will be a conversion of existing Class 321 trains, reengineered by Alstom and Eversholt Rail to create a clean, green train for the modern age. Alstom will also showcase its Widnes modernisation facility, its experience in electrification as well as its Atlas family of ERTMS products. BCRRE will showcase fundamental university-based research and more developed concepts that are ready to take to market. Visitors will have the opportunity to discuss their research needs and ideas with BCRRE to see how the team could support their businesses. A key part of BCRRE’s stand will be to showcase DIGI-RAIL, an ERDF-funded project designed to help SMEs in the Greater Birmingham and Solihull Local Enterprise Partnership and Coventry and Warwickshire areas get access to world-class expertise to develop in the rail industry. SilentTrack – tuned rail damper system to help reduce pass-by noise. HS2 will be giving delegates an understanding of the pipeline of opportunities on the project, both directly and through the supply chain. In particular, it will be focussing on its rolling stock procurement for 54 new high-speed trains, which has a total budget of £2.4 billion, and the upcoming rail systems procurements which cover the range of services to operate the railway, including signalling and telecomms. New trains, innovative digital solutions and signalling technologies will all be on this display. 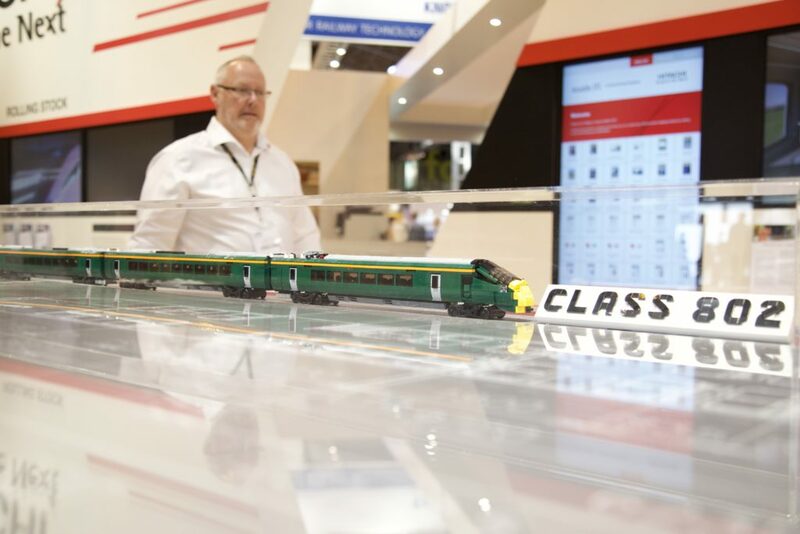 There will also be a range of interactive experiences and competitions throughout the event to showcase how Hitachi will continue to innovate and deliver industry-leading technology for the railways of the future. Inside Out Group, specialists in time lapsed films, high end, on ground or aerial filming and photography, CCTV and access control installations. Rail Media will, as usual, be heavily involved in Railtex. RailStaff – the industry’s most popular read that covers the extraordinary achievements of its people as well as the latest developments in health, safety and training – will also be on the stand, so it is well worth a visit, particularly if you have some good news to share! Sister title Rail Engineer, the magazine written for rail engineers by rail engineers, will be hosting the Technical Seminar. RailwayPeople.com, the industry’s biggest and most productive job board, will be powering Railtex’s own Recruitment Wall, so you can see the recruitment team there – stand C65. 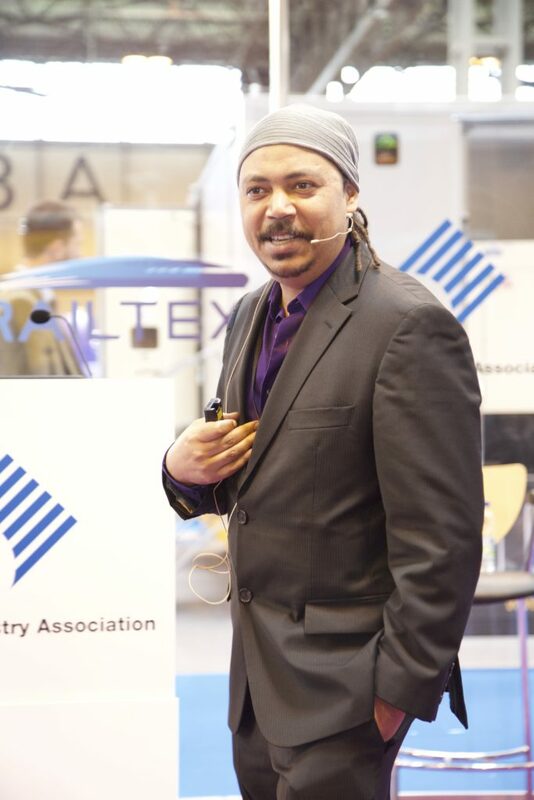 Rail Events staff will also be on hand to discuss industry conferences and awards that are very different from the formal gathering at Railtex. The Partnership Awards, at which Network Rail will recognise the excellence of its supply chain, Rail Summits on Safety and BIM & Technology, RailWorx, where civil and systems engineering companies can show off their latest ideas outdoors and working, and the RailStaff Awards, the only industry awards evening that celebrates the industry’s people and champions, will all be represented, so drop in to find out more. For the first time in the show’s history, RIA will bring its members together in a dedicated hub to offer a platform for SMEs. RIA is also organising the Knowledge Hub and the Future Focus Conference. Rail industry body RSSB will be profiling some of its most popular products and services, including the Railway Industry Supplier Qualification Scheme (RISQS) and the Rule Book app. The team will also be on hand to talk about how RISQS can help suppliers access the GB rail market, and scheme members can arrange to meet the RISQS team on the stand by appointment. Staff will be there to talk through the wider product range and benefits of joining RSSB as a member or an affiliate. Three leading PPE companies: Polyco, JPS and Pulsar, which have a combined experience of more than 150 years, will be exhibiting together as ‘Safety in Numbers’ at Railtex 2019. Included in the joint display will be JSP’s Powercap Infinity – a fully integrated TH3 powered air respirator providing eye, face, hearing and respiratory protection in one compact, head-mounted unit, which has engineered out cumbersome and restrictive waist-mounted units and hoses. Visitors will be able to experience the benefits of digital rail technology through an automatic train operation rail simulator and other applications that Siemens has developed in this area. There will also be displays of the low-cost, digital-ready technology deployed for the first time on the North Wales Coast upgrade programme. Solutions developed for smart ticketing, passenger information systems, passenger flow and station information systems will also be presented. Siemens Mobility’s latest high-speed train, the Velaro Novo, will be on display. Finally, there will be an ‘innovation station’ for visitors to explore. This area will showcase some of the research projects and plans that are in development plus concept products for level crossings will sit alongside new grab handles, best practice across equality diversity and inclusion, careers and education. Following on from announced proposals to build a factory in Longannet, Scotland and an innovation centre in Chesterfield, England, should it secure a major order, Talgo returns to Railtex. Already it has a presence in 28 countries and hopes to significantly step up its UK footprint. The above is but the briefest of introductions to the hundreds of companies which will be exhibiting at Railtex. Make sure you plan in advance, pack those business cards and don’t forget to register before you get there. Entry into Railtex 2019 is free for all visitors who pre-register their attendance before the May 13 cut off point, from which point it will cost £20. For more information, go to: www.railtex.co.uk.